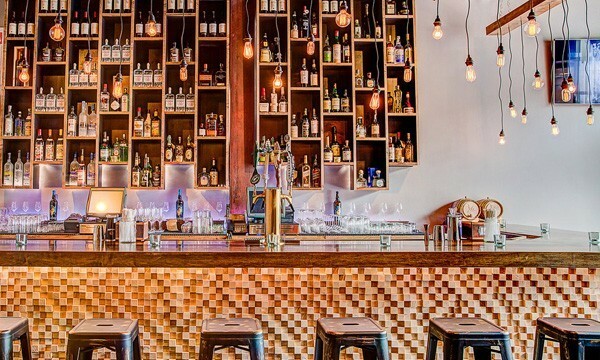 This space, with a counter facing an open kitchen in the rear, is long and designed “like gritty rock and roll Brooklyn.” Mirrors are covered with graffiti and birdcages are suspended above patrons seated at wood slab tables and leather banquettes. The restaurant’s original space now houses a stylish bar adorned with dangling light bulbs while Charlie Chaplin films are projected on a nearby wall. It’s also home to four taps pouring beers from Radiant Pig, Montauk and Lagunitas. The only samesies, fortunately, is a menu of 15-ish miniature plates (Hamachi crudo, soy-braised short ribs) delivered by attractive servers wearing loose bowties and suspenders. What To Drink: Barrier Brewing has a permanent home as one of Swallow’s four drafts. The beer usually rotates weekly. “They’re just so exciting and brew almost every style which is great to pair with food. They fit right in with our philosophy,” Tchinnis said. La Pete, a light and spicy Belgian-style ale brewed with wheat malt and peat-smoked barley (the smokiness isn’t overpowering), was recently poured from the Oceanside-based brewery. Also: A menu of superb bottles and cans was launched with the remodel, including a pair from Oskar Blues: G’Knight Imperial Red Ale (sticky and hoppy) and the snappy-crisp Mama’s Little Yella Pils. 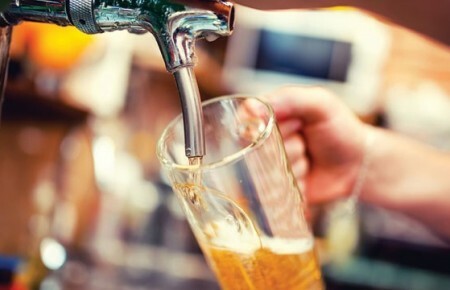 What To Know: The proliferation of “better beer” continues to radically improve options for drinkers on Long Island. Now even some unlikely venues are stocking noteworthy portfolios. A sterling example is this Gulf filling station—typically sources of swill— on Northern Boulevard. A homebrewer of 22 years, Neil Grimaldi has impressively customized this Gulf, opened by his father in 1979, assembling a hefty lineup of bottles from Goose Island, Great South Bay and Founders. What To Drink: Two Roads Rye 95, a Belgian-style blonde ale driven by rye. Also: Knee Deep, an excellent hop-driven brewery based in California has recently started distributing in New York. I recommend 22oz bottles of Belgo Hoptologist, a cosmopolitan IPA brewed with American hops and a Belgian yeast, and the beastly and dank Simtra Triple IPA. 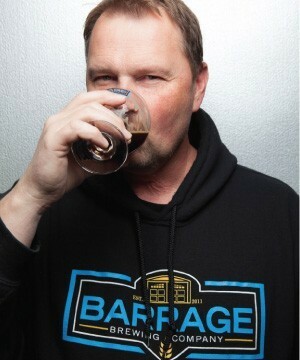 As a homebrewer, Steve Pominski built a 2-draft, 16-foot bar in his garage to swig the overflow of beer with friends. The setup was cleverly anointed “The Barrage,” which eventually inspired the name for his exciting one-barrel brewery on Allen Boulevard in Farmingdale. A bar is also present at his professional endeavor, though larger, with eight drafts avail- able for growlers and on-premise flights (seated on cowhide stools). a viscous oak stave-aged stout honoring his bathtub-brewing grand- father during Prohibition; and Yada Yada Yada, a Seinfeld-inspired, Snickers-infused brown ale. Tribal Cow, which Pominski called a “chewy and creamy toasted coconut caramel milk stout,” debuts in January.